Las Vegas, NV, USA - January 6, 2017 - In his 2017 Consumer Electronics Show (CES) keynote, Nissan chairman of the board and chief executive officer Carlos Ghosn announced several technologies and partnerships as part of the Nissan Intelligent Mobility blueprint for transforming how cars are driven, powered, and integrated into wider society. These technologies will advance mobility toward a zero-emission, zero-fatality future on the roads. 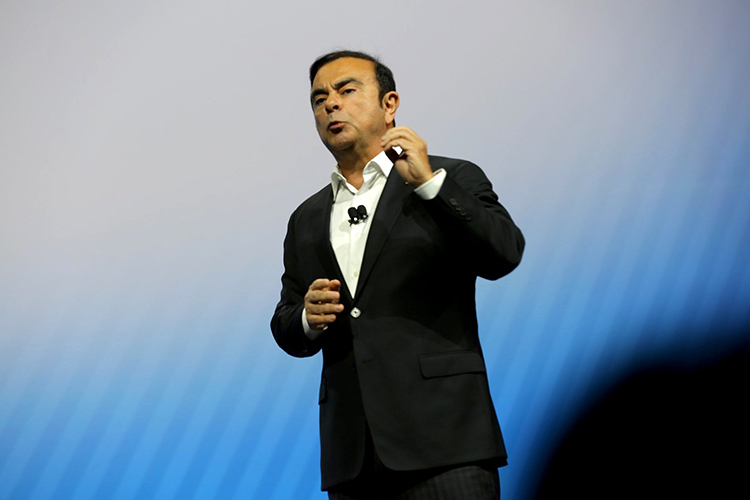 Nissan chairman of the board and chief executive officer Carlos Ghosn announced several technologies and partnerships as part of the Nissan Intelligent Mobility. These technologies will advance mobility toward a zero-emission, zero-fatality future on the roads. In his 2017 Consumer Electronics Show (CES) keynote, Nissan chairman of the board and chief executive officer Carlos Ghosn announced several technologies and partnerships as part of the Nissan Intelligent Mobility blueprint for transforming how cars are driven, powered, and integrated into wider society. "At Nissan, from the beginning, we work to bring the right technologies for the full spectrum of our vehicles and the most amount of people," said Ghosn in his keynote. "This takes more than innovation. It takes ingenuity. And it's exactly what we deliver through Nissan Intelligent Mobility." • To accelerate the time it will take for autonomous vehicles to get on the road safely, Ghosn announced a breakthrough technology called "Seamless Autonomous Mobility," or SAM. Developed from NASA technology, SAM partners in-vehicle artificial intelligence (AI) with human support to help autonomous vehicles make decisions in unpredictable situations and build the knowledge of in-vehicle AI. This technology could potentially enable millions of driverless cars to co-exist with human drivers in an accelerated timeline. It is part of Nissan Intelligent Integration. • Taking the carmaker's autonomous drive strategy another step further, Ghosn announced that leading a Renault-Nissan Alliance engagement, Nissan and Japanese internet company DeNA will begin tests aimed at developing driverless vehicles for commercial services. The first phase of testing will begin this year in designated zones in Japan, with a focus on technology development. By 2020, Nissan and DeNA plan to expand the scope of their tests to include the commercial usage of driverless technology for mobility services in the Tokyo metropolitan area. • In addition to advancements in Nissan's autonomous driving strategy, Ghosn also announced plans to launch a new Nissan LEAF, with ProPILOT technology, enabling autonomous drive functionality for single-lane highway driving. This new LEAF will build on the company's leadership in electric vehicles, which includes having sold more than 250,000 Nissan LEAFs sold worldwide since 2010. Ghosn said the new LEAF is coming in the near future and represents the next chapter of Nissan Intelligent Power. 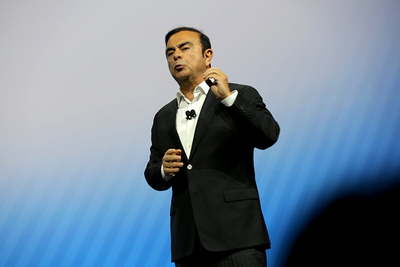 • On connected cars, which combine Nissan Intelligent Driving and Nissan Intelligent Integration, Ghosn announced that the Renault-Nissan Alliance is continuing its partnership with Microsoft to build the next generation of connected car technologies. The keynote included a demonstration of how Microsoft's personal assistant technology Cortana can make driving more efficient and seamless. Cortana is one of the technologies that the Alliance and Microsoft are exploring together. • To support the policy environment and planning needed to integrate these technologies into the world's cities, Ghosn announced a new partnership with 100 Resilient Cities - Pioneered by The Rockefeller Foundation (100RC). 100RC is a global non-profit working to help cities build resilience to physical, social and economic challenges. Together, Nissan and 100RC will help cities lay the groundwork for autonomous drive, electric vehicles, and new mobility services. Nissan is 100RC's first automotive platform partner. "We invite others to join us, as well, from tech partners to e-commerce companies, ride-hailing and car-sharing platforms, and social entrepreneurs who can help us to test and develop new vehicles and services, and make sure everyone has access to the latest technologies and services that bring value to their lives," said Ghosn. Follow along on Twitter with hashtags #Nissan #CES2017. In fiscal year 2015, the company sold more than 5.4 million vehicles globally, generating revenue of 12.2 trillion yen. Nissan engineers, manufactures and markets the world's best-selling all-electric vehicle in history, the Nissan LEAF. Nissan's global headquarters in Yokohama, Japan manages operations in six regions: ASEAN & Oceania; Africa, Middle East & India; China; Europe; Latin America and North America. Nissan has been partnered with French manufacturer Renault since 1999 and Mitsubishi Motors since 2016 under the Renault-Nissan Alliance.